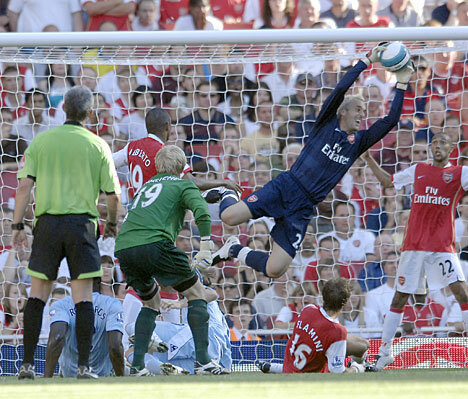 “3 cup finals”, Almunia gets lazy, Jack at the Olympics and everything you kneed. The players looked on in wonder as Almunia's rocket-boots finally worked. Wednesday morning greetings, brave souls. Chelsea has defied the odds and made it to the Champions League. Even as I’m writing some 12 hours later, I’m still having trouble getting my head round such a gruesome fact. What I’m sure will be heralded in the press as a monumental defensive performance, was a game that baffled me. I begrudgingly concede that Chelsea do deserve credit for coming away from Spain with a score-draw, but I’m stunned that Barcelona didn’t progress over the two legs. I doubt they’ll ever dominate two games as much again and lose. From an Arsenal perspective, it means that our quest for 3rd place in the Premiership has taken on another level of importances. If Chelsea were to emerge victorious in the final – I shudder at the thought – them 4th place won’t qualify for the ruches of Europes premier club competetion. I can’t envisage anything worse than that. Chelsea and all their corrupt oil billions are about as deplorable a club as you could ever be unfortunate enough to see. They’re bad enough to make me cheer for Barcelona. The though of John Terry being unable to play the final because of his own arrogant stupidity doesn’t help; you know if they win, he’ll triumphantly demand to be the first to lift the trophy. I don’t buy into this ‘support a team for a day’ malarky, but I’m certainly going to make an exception with either Bayern or Madrid. Back to Arsenal. As Kieran Gibbs has said, we have “3 cup finals” left to secure that 3rd place, starting with a trip to the Neanderthal Stadium this weekend. If we cant beat Stoke, Norwich and WBA, then we’ll qualify. Newcastle are breathing down out necks, but I’m happy knowing the outcome rests entirely in our own hands. We can ill-afford any blunders or inept performances. It’s hard to say he’ll be missed, but I do genuinely feel it’s unnecessary to rip him to shreds. I’ll remember him for the performance at The Emirates where he single-handedly kept out Barcelona, not the litany of infuriating mistakes and peculiar decisions. Elsewhere today, Stuart Pearce has refused to rule our selecting Jack Wilshere for the Olympics team. Whilst I think a Great Britain squad is a colossal waste of time, and one that affects clubs greatly, I do think participation should be up to Jack. If he’s fit, and it won’t impinge upon him playing for Arsenal, then it might work out to be a nice pre-season warm-up. What do you think? Is Pearce being a bit of a prick? Are the Olympics pointless, or a great opportunity? Let me know your views in the comments. Identified: Arsenal’s top 3 transfer targets for the summer. Bendtner returns, UEFA’s dream final and quick news.